It might not be the first day of April in the likes of Europe and North America, but it is in the likes of Japan and already the hijinks are well underway and creative to boot. One of the first fool’s jokes to be spotted concerns a square shaped Kirby. 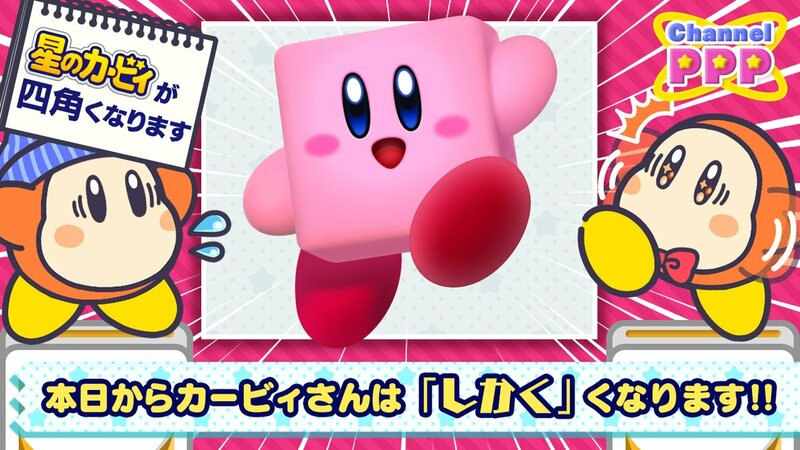 Not only has imagery pertaining to Kirby Star Allies and Kirby’s Extra Epic Yarn, now feature Kirby as a square shaped character, but there’s even an official website dedicated to this rendition to Kirby. The thing about this redesign though, is the fact that this is not the first time we’ve seen Kirby presented in such form. For those of you who picked up BYE-BYE BOXBOY! for the Nintendo 3DS, you might remember the fact that the likes of the Kirby series of amiibo are supported by the game and that by scanning in the Kirby amiibo, you could unlock a square shaped Kirby costume and the same could be said for Meta Knight, King Dedede and Waddle Dee. But that’s not the end of the April Fool’s antics we’ve got to talk about, since even Ash Ketchum is also getting in on the action today. With constant reports flying in across the globe, instead of Smeargle being the one to photo bomb players of Pokémon GO, it’s now Ash Ketchum or Ash Cap Pikachu who will appear. Furthermore, Ash Cap Pikachu can be caught and it can appear in Shiny form as well. However, this will only happen five times so be sure to make the most of it, but what I like about this bizarre instance is the face that on this day in Japan, April 1 marks the 22 anniversary since the first episode of the Pokémon anime aired. April Fool’s or not, it’s still a great way to celebrate a momentous occasion.